Micro Finance Institutions (MFIs) and Regional Rural Banks (RRBs) operating in rural India, experience unreliable power supply and intermittent load shedding, which inhibit regular business operations. These organizations install Inverters/Diesel Generators, to provide power back-up for keeping business as usual. Such methods entail significant capital expenditure and also deemed unfriendly to the ecology. 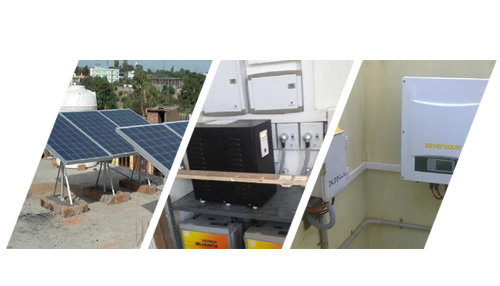 E-Hands Energy uses affordable, sustainable and scalable renewable energy technologies, to power Regional Rural Banks and Rural Branches of Micro Finance Institutions across India. Solar system provides backup power for 5 – 6 hours of operation. The technology central to our innovation was the use of High Voltage DC Solar Optimizer to power PCs/Citrix thin clients.